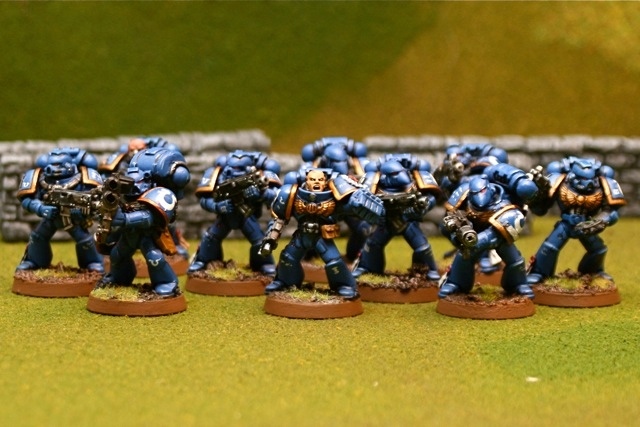 In my first update, I forgot to post a picture of my third tactical squad. I think my unhealthy obsession with plasma weaponry is starting to come through. I also see know that the barrels on the multi-melta need to be addressed at some point, though it does look good from a side angle. Currently, I talked with some gaming buddies of mine, and its uncertain when my first game in 5th edition will be. We have been playing plenty of co-op board games, RPG's, and *gasp* Lord of the Rings- but the mood my parts of the world towards 40k has grown soar for reasons that I don't really understand. To add some insult, the local GW store closed last month leaving most players in the metro St Louis area to play in their basements. In other words.. the local gathering spot has been killed. There are still a couple of Independent stores around, but each of them have their issues (driving time, odd store hours, etc.). Over the weekend- I completed a large chunk of the army. I'll post more pictures tonight. All totaled, right now I have over 2,000 points painted and ready! And over 2,000 points left to go! !